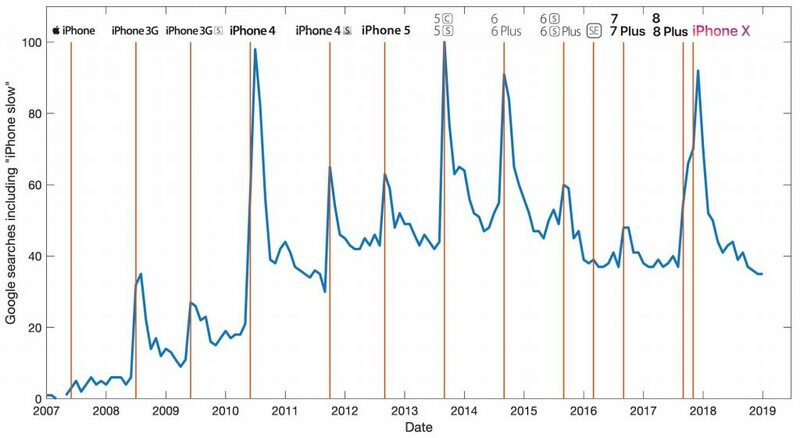 In 2016, Apple openly admitted to the slowing down of their iPhones. This strengthened consumer concerns about the longevity of Apple’s products, and raised questions as to whether the technology firm were deliberately limiting the life of their products. Apple confirmed that software updates were slowing down older models, allegedly to account for reduced battery performance over time. However, the alignment of performance degradation with the release of new iPhone models has aroused suspicion. This is indicated in the graph below. While some level of natural degradation is to be expected in all products, deliberately accelerating this deterioration is of major concern to the consumer. It is also disputed as to whether this business practice is legal. Furthermore, in a world increasingly focused on sustainability, is this type of business model morally acceptable from one of the world’s largest tech firms? The use of performance degradation in iPhones could be viewed as unjust because of the controversial production of sealed units, the increased environmental waste and questionable legality. The use of sealed units by large tech firms, such as Apple, limits the consumer’s options for repair. This forces the customer to pay for replacement parts such as batteries (as well as the replacement service) or risk voiding the warranty by using cheaper third parties. This has been taken to even further extremes with Apple creating specialised tooling, not available to the public, for the repair process. This blatant obsolescence tactic is just one way in which Apple extort money from customers. Also, is it fair to expect consumers to pay up to £1000 for a new iPhone, just to have access to the latest technology because their previous model failed? Since this is obviously detrimental to the relationship between Apple and the consumer, it could be viewed negatively from a care ethics stand point. Apple’s business strategy of slowing down iPhones seems to be at odds with a world striving for sustainability and environmentally friendly products. It could be argued that this deterioration strategy forces consumers to buy new phones more regularly, therefore increasing waste. One major concern is that finite rare metals such as indium and yttrium, which are used in mobile phone screens, end up in landfills. These two elements can be harmful if ingested or inhaled and can leach into the water surrounding landfills, following the breakdown of the phone’s materials. Another concern is that indium could be so heavily mined that it could run out altogether within the next decade. Would this be the case if people had only used one iPhone over the past decade? Where did your old phone end up? Despite software update terms and conditions warning that installation may affect usability of apps and services, it is disputed as to whether this sufficiently protects Apple legally, as contract law forbids deception and concealment. Lawsuits in California and France question the legality of Apple’s methods and, from a deontological ethics view, their moral duty to the consumer. This theory is governed by the morality of an action. In this case, the morality of the action would be improved if Apple highlighted more clearly the performance loss associated with the software update. Apple have argued that performance deterioration and automatic shutdown of devices is required to protect the internal electronic components, due to the inability of aged lithium ion batteries to supply peak currents. Would you prefer to have a slow phone or a broken phone? Apple is one of the largest tech firms in the world. In 2018, it became the first trillion dollar public company, pipping Amazon to the post. This market valuation would place Apple as the 17th largest economy in the world when compared to national economies. The company is clearly of huge benefit to both the US and global economy, creating jobs and large tax revenues. Apple currently employs 1.76m staff across Europe. Further to this, the App store has created an independent economy, nurturing a range of new startup companies such as Snapchat, Uber and Instagram. There is no doubt that maximising sales of each new iPhone release, potentially through planned obsolescence tactics, has contributed to Apple’s success. Since the release of the first iPhone in 2007, over 20 models have been released, more than one per year. Comparing the first iPhone to the newest model, the technological advancements would be obvious. Some examples of Apple’s innovative technologies include the retina display, touch ID, and Apple pay — features that provide convenience and security to users. Apps such as Snapchat rely on the improved capabilities of the latest iPhone release to support their ever increasing functionalities. As a society becoming ever more dependent on handheld devices, striving for increased interconnectivity, such innovations are essential to meet consumer demands. Increasing the sales of the latest iPhone through obsolescence tactics has brought many of these technologies into the mainstream. This then increases customer expectations for the next release, and provides Apple with the profits to continue innovating for future models. It also promotes competition, forcing other companies, such as Samsung, to keep up. Performance deterioration has been a key factor in the progression of technology in recent times, for example, if the original iPhone lasted 10 years without slowing down, would Apple have reached the iPhone X, or would we all still own a first generation iPhone? Utilitarianism provides an argument supporting Apple’s performance deterioration tactics. This ethical theory is concerned with providing the greatest pleasure to the greatest number of people. By driving technological progression, creating jobs, and providing economic benefit (albeit through obsolescence tactics), Apple have increased the quality of life, and therefore the happiness, of a large fraction of the global population. We argue that this pleasure outweighs the negatives caused by performance deterioration. As engineering students, we are torn between striving for innovation and the desire to design durable, long lasting products. Considering both points of view, we believe the ethical arguments in favour of performance deterioration outweigh those against. Our reasons for this stem from Utilitarianism, since technological progression provides benefits to the masses, such as increased worldwide interconnectivity and economic growth. In Apple’s defence, something that hasn’t been mentioned is that the release of a new iPhone coincides with the release of a new operating system. Typically, a revamped OS will often come with a few bugs and be a little slow to begin with, and Apple quickly releases a x.0.1 version to sort the issues, hence the sharp decline in “iPhone slow” searches. These updates provide new features for older iPhones (up to 5 years old) for free! Therefore, I believe their intentions are actually good and would be an example of Utilitarianism, just not perfectly executed. However, I think they should have been more open about their throttling of performance due to battery life, like you mentioned. I would also like to compare iPhones to other smartphone manufactures to see if its actually the technology limitations that are the problem. Thank you for this comment – it is certainly true that IOS operating systems align with the release of the latest iPhones and this is not considered in the article. It is an interesting point you raise regarding seeing this as positive example of Utilitarianism. As an environmentally conscious consumer, the idea of planned obsolescence is, to me, reprehensible. Regardless of the minuscule short-term benefits available to us the consumer, the long term effects on us are: the failure of what would have been a perfectly usable phone; an increase in power and market control of a clearly amoral company; and, most importantly, a vastly increased environmental cost from mining for rare earths for new phones. Furthermore, while the top end of consumers can have the new iPhone and therefore a better quality of life, the people at the bottom of the consumer food chain are stuck with no option but to have no phone or no battery life. It does not seem moral for apple to reduce worldwide accessibility of their products; if they still sold new, old generation iPhones, they would operate in a larger section of the market, high-end and low-end phones. while this is not their usual USP, maybe Apple should consider the wider impact of marketing their phones only at the top end of the market. Having said all of this, we have very little choice/motivation to change as consumers. If you need a product that does exactly what you want it to with very little thinking required, Apple are the best hands down. I write this on a MacBook while listening to music on an iPhone, surrounded by others doing the same or similar. It is interesting to me that even though we can have strong opinions on the morals of a company, as consumers we struggle to justify the change we would need to make in order to boycott. As such, is it not more the problem of government to fix this as an issue, since consumers can’t/won’t? Thank you for such a comprehensive comment – this will certainly come in useful for assignment two. The points you raise are very though provoking especially the idea that consumers are in some way reliant on Apple products that no matter what their business model / attitude to the environment is. This comment was also written on a MacBook for that matter! – Thanks! Justifying planned obselescence with Utilitarianism is questionable considering a massive percentage of the population would be priced out of keeping up to date with the latest iPhone model. It could be argued that purposely causing legacy phones to perform worse would have an adverse effect on the quality of life for these people, perhaps also causing their productivity to drop, and thus a drop in their economic output. This effect may outweigh the economic boost that increased phone model turnover has on society, as economic activity in other areas could fall due to people owning slower phone models. This is likely to be more evident in the poorest societies. The Utilitarian view can be argued both ways and as you say slowing of legacy phones will have a negative economic effect particularly in poorer populations. A very interesting article, great work. I would agree that when considering the environment it seems unethical to design obsolescence however to remain competitive with the likes of Google and Samsung there is constant pressure to incorporate the most up-to-date technology. Nowadays many of the technological advancements in the smartphone industry are associated with software. Perhaps a more ethical, environmentally conscious business plan would be for Apple to design longer lasting hardware, but then charge an additional fee for software upgrades? Thank you for the comment. That is a very interesting idea developing more durable hardware with paid software upgrades. Definitely something to consider! The points raised about planned obsolescence (a tactic used by an increasing number of industries) aiding technological growth are valid. However, some poorer customers who might be content with a slower, older model of iPhone now find themselves unable to use their phone to carry out even the most basic of functions. The nature of Apple’s products is such that once you sign up to Apple’s ‘ecosystem’, it is difficult to leave. For example, users who choose to use a PC along with an iPhone struggle, as information such as reminders and calendars is not easily shared cross-platform. Many customers therefore become trapped in the system, as switching to another platform is never convenient or simple. I think it is this which is the real issue here. The problem is that Apple is exploiting the fact that customers become locked into buying their products, and use that to their advantage. And this recent battery revelation has only increased customers’ awareness of the dirty tactics used by the company. Despite this, customers continue to remain loyal to the Apple ecosystem, because many rival companies are also playing the same game. Thank you for the comment – I very much like the idea of Apple’s ‘ecosystem’. Very thought provoking! It is so true that consumers remain loyal to Apple – likely also due to the fact that the majority of the time the products do fulfil the needs of the consumer and people negligently believe degradation comes part and parcel of wear and tear. I would find it hard to conclude that happiness of the masses makes the environmental destruction excusable. All industries, including Apple, should hold responsibility for environmental effects they are having, as ultimately it is their approaches that must be changed to really see global changes. Will be interesting to see more on this in the future, what with recent media attention to ethics in other industries, like the fashion industry, it would seem that much more is to be said about ‘tactics’ within tech companies like Apple. Would like to know more about the laws on this in the UK. I think it is also worth considering wether these products really are ‘providing benefits to the masses’. Are these the masses of employees in their factories, or those lucky enough to be able to afford an iPhone X? Thank you for your comment – It is fair to argue that large companies must be held accountable for large scale environmental impact – or should we the consumer?? Like you mention “The masses” is also up for debate! I found the article informative and thought provoking. I am inclined to agree with the overall conclusion, that the benefits provided by technological progression are the overriding argument for Apple to constantly strive to improve their products and stay ahead of the competition. I have no major issue with companies, including Apple, adopting tactics to protect their Intellectual Property by, for example making it difficult or even impossible for unregistered technicians to maintain their products. This is a tactic that the motor industry has long adopted. Only European Block Exemption rules allow drivers to have their cars serviced by an independent garage without invalidating warranties, but even then there are strict rules about when and how the service must be performed. As one respondent pointed out, if there is a widely held feeling that Apple are overstepping the boundaries of what is acceptable, it may be for Governments to intervene. The one area which Apple does need to address is the environmental impact of its tactics. Again, using the motor industry as an example, buyers of new cars don’t simply through their old ones into landfill. A better part-exchange system, that allows older phones to be maintained or upgraded so that they still provide a reliable product for those not able to afford the latest technology may help to address this. At worst, a worthwhile part-exchange scheme would mean that the components of useless phones could be recycled or safely disposed of. Thank you for your comment – a part exchange system is a great idea and would help reduce the environmental impact – the implementation of such a plan would be costly however – would Apple be prepared to do such a thing? When you start to discuss sealed units and specialised tools you are straying away from the core argument, which is should deliberate obsolescence be designed into a product. In assignment two develop the care ethics argument. You touched on it briefly, but good arguments for both sides could be developed from this perspective. Also, from your article it looks like you’ve got at least four stakeholders: Apple, app designers, Apple’s customers and recycling/refuse facilities. Thank you for you comment Patrick. These are certainly areas on which we can build for Assignment two. There are numerous stakeholders as you have pointed out which will also be considered in Assignment two. Really interesting article with some points that I had not previously considered. I feel like debates of this nature are just beginning and will rumble on for the foreseeable future. When it comes to the trade-off between duration and innovation it becomes an impossible task to find a perfect balance, however if you keep in mind the necessities of the masses when you articulate your ideas into the physical form then you will have a greater chance of finding what you are searching for. I’m excited by the propensity for debate within this field and I’m sure it will continue to rage on like a violent storm on a warm autumn night. Thank you for you comment I couldn’t agree more – the topic of planned obsolescence is highly controversial and will continue for the foreseeable future! This is a very interesting article which highlights a topic which affects many people worldwide. The argument FOR deliberately limiting the life of Apple’s products leads to large impacts on key stakeholders in this issue. 1) The consumer – the directly negative impact poor performance has can lead to anger and potentially a lack of trust which is key in appealing to a mass market. 2) The environment – the negligence from Apple to design for monetary gain without considering the adverse impact on the environment is astonishing. 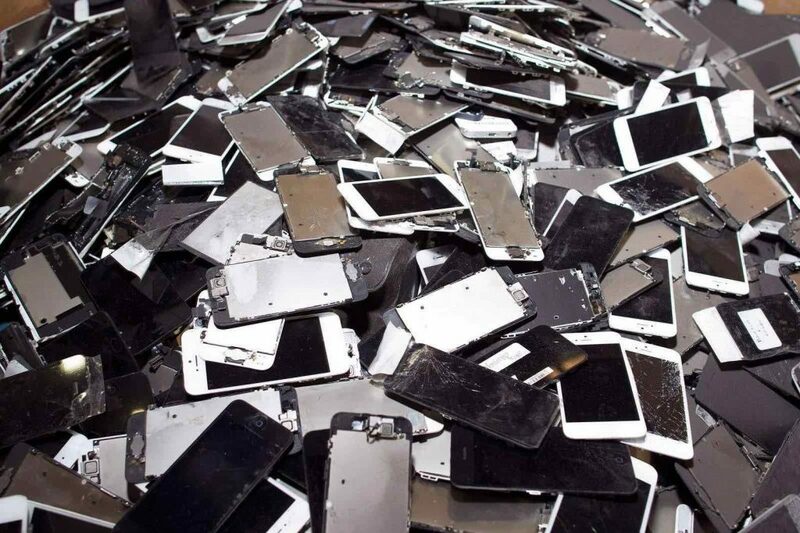 Waste disposal will become a government issue as a phones begin to stockpile and pollute the earth. Thank you for your response, the direct impacts on stakeholders are very large which is compounded by the increased use of smartphones with advanced features. ^^The above two comments are from WhatsApp Messenger. A very interesting article which raises some difficult issues. There is no doubt that the speed of technological development is an important factor in sustaining jobs and creating increasingly advanced products of benefit to affluent customers. However, there are many others for whom the older technology still meets their needs and I agree with the arguments that Apple could take more responsibility to facilitate this market by supporting its products for longer. The environmental cost of the constant innovation and the resulting throw-away culture cannot be ignored and, as has already been pointed out, as there aren’t many individuals who will choose to inconvenience themselves for the greater environmental good, it could indeed be time for government to intervene. The French Government has already taken action to fine organisations found to practice planned obsolescence. Thanks for the comment. The point you raise about the publics stance regarding caring for the environment and the associated inconvenience it creates is key in the current climate with climate change protests occurring worldwide – most recently in London. It could certainly be the time for government action in order to reduce Apples environmental impact. This is a well written article that reaches a natural conclusion through a balance of evidence and ethical reasoning. There were some occasions where you could have made an ethical point but didn’t. In your “The Environment is Over-raided” section, you mentioned that the environment is being harmed through mining and landfill waste but did not evaluate using an ethical framework. Perhaps you could explore Apple’s relationship with the environment from a care ethics standpoint? For example, it looks like you are pointing out that Apple’s actions lack empathy for the environment and therefore are not okay. There are many companies who employ similar tactics; many products have a short warrantee. From a Kantian point of view, Apple are just obeying a consumerist norm (obsolescence tactics) that is accepted and widely practised across many sectors. If they didn’t they would lose out to their competitors. One final point I would make is that your statement “Apple have increased the quality of life, and therefore the happiness, of a large fraction of the global population” is questionably justified on the basis of smartphone technological improvements. It seems like an assumption that some of the technological advances you mention are actually good for us; are the Snapchat improvements really helpful? You even mention “society becoming ever more dependent on handheld devices”, which I would not necessarily see as a good step for mankind. Has the increased ease of social media (this is something I see has increased with smartphone development) really made our lives better? I think it could be argued that Apple know how addictive people find smartphone technology gimmicks and are exploiting us by making more and more tasks dependent on the technology. Thank you for the very detailed comment considering the topic from an ethics standpoint. This will help us with Assignment 2. Apples relationship with the environment raises clear opinions. From a business view to remain competitive new products MUST be released. However from an environmental view Apple cause huge damage. The points you raise questioning the so called “improvements” in app technology are very interesting as in recent human interactions i have certainly noticed a lack of approachability. Are we beginning to stop communicating with words and instead use technology for all daily interactions?